Mike Ashford might have realized he had it for Cassie for many years, but he also knew what kind of woman she was. Cassie Delistraty was just like her mother, Lucia. They could cause a ruckus just by entering a room, flighty, and unable to commit to a relationship. Neither had had relationships that work. Cassie had been divorced, while Lucia had never been married. And although Cassie's parents obviously loved each other, and her dad proposed every year, Lucia had never said yes. Mike didn't need that in a relationship. However, the idea to pretend he was in a relationship could meet his needs. Cassie wished Mike would get over looking at her as if she was a little sister. Her twin Cal and Mike had been best friends for years, but Mike had never given Cassie a second look. After Mike calls Cassie to stop the disorder Lucia was causing at his club, the two of them fall into a lie. In order to get Lucia off the idea of finding a man for Cassie, she and Mike pretend to be dating. Thus begins a series of lies of trying to prove to her family that they are in love, while actually lying to themselves that they're not. Pretend You Love Me is a story that fans of romantic comedy will simply relish. Stacia Wolf deftly developed an entire cast of characters. Lucia will keep you laughing every time you meet her, but hides a vulnerability that is touching. And of course any reader will understand Cal's protective instincts for his sister, even against his best friend. However, watching Cassie and Mike try to trick her family, while coming to terms with their love is the ultimate highlight of the book. 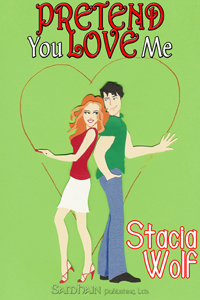 Stacia Wolf is an author to watch.